From one off swimming pool cleaning service or regular swimming pool maintenance, or even pool care while you are on holidays, our pool care services and swimming pool cleaning team are happy to assist. Our full time professional swimming pool cleaners will keep your pool pristine; let us do all your swimming pool maintenance work so you can sit back and relax. Not only to we offer our swimming pool mainenance and cleaning, but we also provide deliver of swimming pool supplies such as Chlorine, pool filters or pool cleaners and equipment. Also, water balancing at your pool are only a phone call away. Call the office for all bookings 9452 2192 and have a chat with us about which pool care services we could provide to give you more time to relax and enjoy your swimming pool! Let your pool sparkle like never before! We only use professional quality pool cleaning chemicals to keep your pool sparkling. 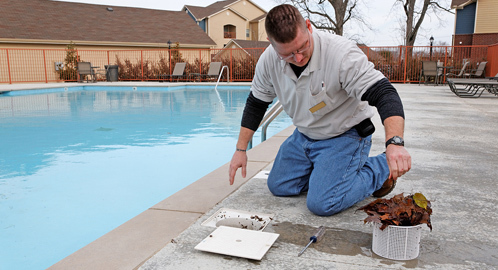 Summer and winter scheduling can be arranged for swimming pool maintenance.